Sometimes you never know what you’ll get when you head out to take some photographs. On this evening I had intended to capture the Austin skyline from the Zilker Clubhouse (which I did) but found myself driving down to Zilker Park well after dark. I had never been to the Liz Carpenter fountain that sits on the south shores of Ladybird Lake, but I figured I would check it out on this cool February evening. To my surprise, there were children playing in the water, and I was wearing long sleeves and a fleece pullover. Maybe I’m getting old, or maybe kids just do not have a built in thermometer! 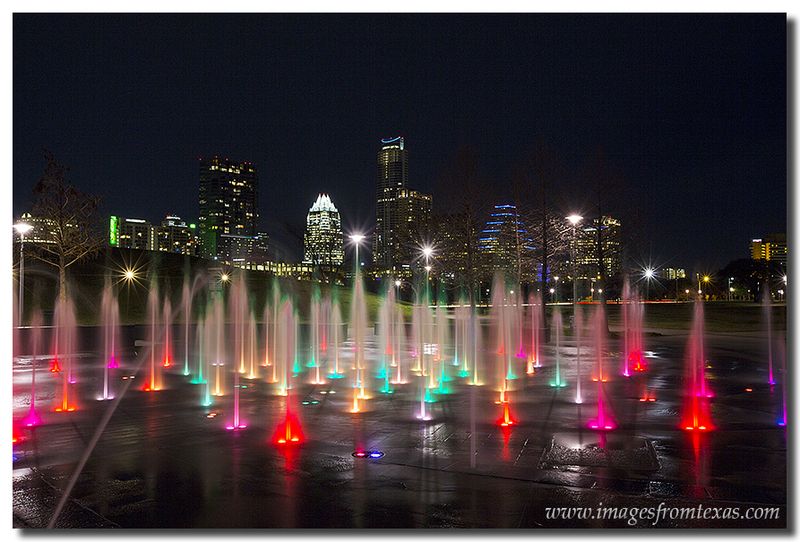 The Liz Carpenter Fountain in front of the Austin Skyline on a February evening. Photography is a lot like fishing. You can take photos, but you don’t always catch what you hope for. I had ventured to downtown Austin early on a Monday morning in hopes of a magical sunrise. The weatherman said the clouds would be parting around 7:00am, which would be perfect for a morning image of the Austin skyline. I arrived when it was still pretty dark. I could tell the clouds were thick, as well. I parked, walked around looking at different perspectives, and kept hoping for that color to show up in the sky. Alas, it wasn’t to be. I walked the pedestrian bridge between Lamar Bridge and the 1st Street Bridge and tried to shoot some scullers going by, but for whatever reason, I wasn’t pleased with those images. 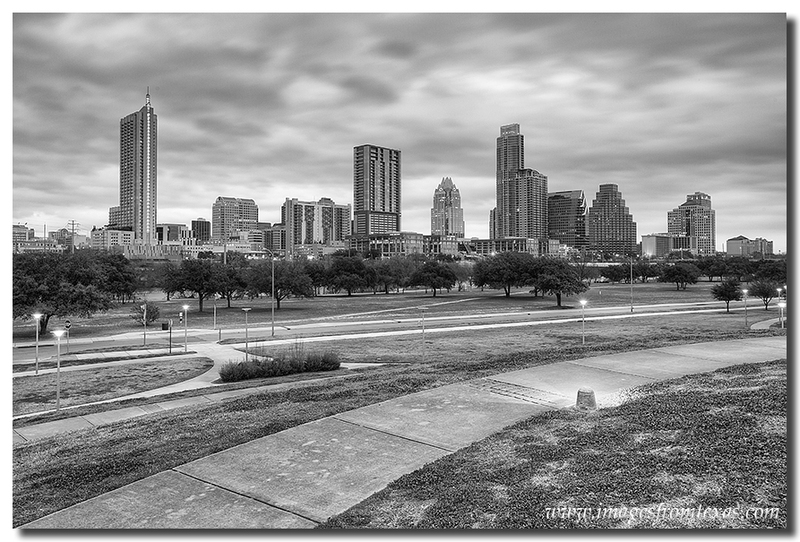 I finally settled on this shot, using sidewalk as leading lines into the Austin Skyline. The clouds were still thick, so I used their motion and shot for black and white. Here is what I came away with. It’s not my favorite, but considering the conditions, I’ll take it. And I’ll be back another morning or evening to try again! Taken from a hill close to Zilker Park, this image of the Austin Skyline shows some of the unique architecture of Austin. On the left is the 360 Condos. In the middle of the pictures is the iconic Frost Tower, and on the right is the Austonian, Austin’s tallest building. If you look closely, you can see Ladybird Lake through the trees. This images was taken early on a Monday morning, so there were not many people out jogging or riding bikes. But come on an evening or weekend and this area will be very crowded. This is a great place to spend some time outdoors and take in the views of the Austin Skyline and Ladybird Lake (Town Lake). I’ve been photographing the Austin Skyline and street scenes a lot lately, along with a few portrait sessions sprinkled in, so when I had the opportunity to use my Texas State Parks Pass, I jumped at the chance. With my folks watching our two girls, my wife and I made the hour-plus trek out to Fredericksburg for a late afternoon meal, then drove on to Enchanted Rock State Park for a little time outdoors. Enchanted Rock reaches 1,825 feet above sea level, and the elevation gain from the bottom is only 425 feet, so this is by no means a strenuous hike. Actually, it is pretty easy walk up, but the view of the Texas Hill Country from the top is pretty nice. If you want to hike around the structure, there are trails and campgrounds and even a small lake on the opposite side from the visitor’s center. The rock itself juts out of the land much like Ayers Rock in Australia. Composed of pink granite, it is the largest monadnock in the United States and is part of the Llano Uplift. Local Indian tribes such as the Apache and Comanche attribute a spiritual richness and power with the rock, and signs of human activity around Enchanted Rock date back 10,000 years. All that being said, it is a nice way to spend an evening. Head out to Fredericksburg for some good German food or a burger, then to Enchanted Rock for sunset. If you make the trip in the spring, you’ll find the trails lined with wildflowers like bluebonnets and Indian Paintbrush. Every once in a while, you stumble across something good that was in front of you the entire time. I’ve been photographing the Austin skyline for a while now, but I’d never visited the Zilker Clubhouse. I knew generally where it was, but for whatever reason, I’d never been there. Well, before sunrise last Saturday, I was on my way downtown to photograph the Hippie Opera and the Taco Express. I was running pretty early (yes, I’m an early bird) so I decided to stop by and take in the view from the balcony. Upon arrival, I was impressed. The Missouri-Pacific Highway (MoPac to Austonians) runs in front of the view, and the city skyline is just across the highway. I decided to wait on the trip to the Hippie Opera in South Austin, and take in the sunrise from this location. Unfortunately, although the sky was brilliant orange, there were no dramatic clouds. I captured the scene, enjoyed moment, and returned home. The next morning I returned in hopes there would be some clouds. This is the view I was greeted with… a glorious sunrise over the Austin skyline. This image is a stitch of several photographs. I also blended in the foreground so it would have some definition.